The previous post about using ZFS with GNU/Linux concerned covering the three RAIDZ virtual devices (VDEVs). This post will cover another VDEV- the ZFS Intent Log, or the ZIL. ZFS Intent Log, or ZIL- A logging mechanism where all of the data to be the written is stored, then later flushed as a transactional write. Similar in function to a journal for journaled filesystems, like ext3 or ext4. Typically stored on platter disk. Consists of a ZIL header, which points to a list of records, ZIL blocks and a ZIL trailer. The ZIL behaves differently for different writes. For writes smaller than 64KB (by default), the ZIL stores the write data. For writes larger, the write is not stored in the ZIL, and the ZIL maintains pointers to the synched data that is stored in the log record. Separate Intent Log, or SLOG- A separate logging device that caches the synchronous parts of the ZIL before flushing them to slower disk. This would either be a battery-backed DRAM drive or a fast SSD. The SLOG only caches synchronous data, and does not cache asynchronous data. Asynchronous data will flush directly to spinning disk. Further, blocks are written a block-at-a-time, rather than as simultaneous transactions to the SLOG. If the SLOG exists, the ZIL will be moved to it rather than residing on platter disk. Everything in the SLOG will always be in system memory. When you read online about people referring to "adding an SSD ZIL to the pool", they are meaning adding an SSD SLOG, of where the ZIL will reside. The ZIL is a subset of the SLOG in this case. The SLOG is the device, the ZIL is data on the device. Further, not all applications take advantage of the ZIL. Applications such as databases (MySQL, PostgreSQL, Oracle), NFS and iSCSI targets do use the ZIL. Typical copying of data around the filesystem will not use it. Lastly, the ZIL is generally never read, except at boot to see if there is a missing transaction. The ZIL is basically "write-only", and is very write-intensive. NVRAM- A battery-backed DRAM drive, such as the ZeusRAM SSD by STEC. Fastest and most reliable of this list. Also most expensive. SSDs- NAND flash-based chips with wear-leveling algorithms. Something like the PCI-Express OCZ SSDs or Intel. Preferably should be SLC, although the gap between SLC and MLC SSDs is thinning. 10k+ SAS drives- Enterprise grade, spinning platter disks. SAS and fiber channel drives push IOPS over throughput, typically twice as fast as consumer-grade SATA. Slowest and least reliable of this list. Also the cheapest. It's important to identify that all three devices listed above can maintain data persistence during a power outage. The SLOG and the ZIL are critical in getting your data to spinning platter. If a power outage occurs, and you have a volatile SLOG, the worst thing that will happen is the new data is not flushed, and you are left with old data. However, it's important to note, that in the case of a power outage, you won't have corrupted data, just lost data. Your data will still be consistent on disk. Because the SLOG is fast disk, what sort of performance can I expect to see out of my application or system? Well, you will see improved disk latencies, disk utilization and system load. What you won't see is improved throughput. Remember that the SLOG device is still flushing data to platter every 5 seconds. As a result, benchmarking disk after adding a SLOG device doesn't make much sense, unless the goal of the benchmark is to test synchronous disk write latencies. So, I don't have those numbers for you to gravel over. What I do have, however, are a few graphs. I have a virtual machine that is disk-write intensive. It is a disk image on a GlusterFS replicated filesystem on a ZFS dataset. I have plenty of RAM in the hypervisor, a speedy CPU, but slow SATA disk. Due to the applications on this virtual machine wanting to write many graphs to disks frequently, with the graphs growing, I was seeing ~5-10 second disk latencies. The throughput on the disk was intense. As a result, doing any writes in the VM was painful. System upgrades, modifying configuration files, even logging in. It was all very, very slow. So, I partitioned my SSDs, and added the SLOG. Immediately, my disk latencies dropped to around 200 milliseconds. Disk utilization dropped from around 50% busy to around 5% busy. System load dropped from 1-2 to almost non-existent. Everything concerning the disks is in a much more healthy state, and the VM is much more happy. As proof, look at the following graphs preserved here from http://zen.ae7.st/munin/. This first image shows my disks from the hypervisor perspective. Notice that the throughput for each device was around 800 KBps. After adding the SSD SLOG, the throughput dropped to 400 KBps. This means that the underlying disks in the pool are doing less work, and as a result, will last longer. Image showing all 4 disks throughput in the zpool on the hypervisor. This next image show my disk from the virtual machine perspective. 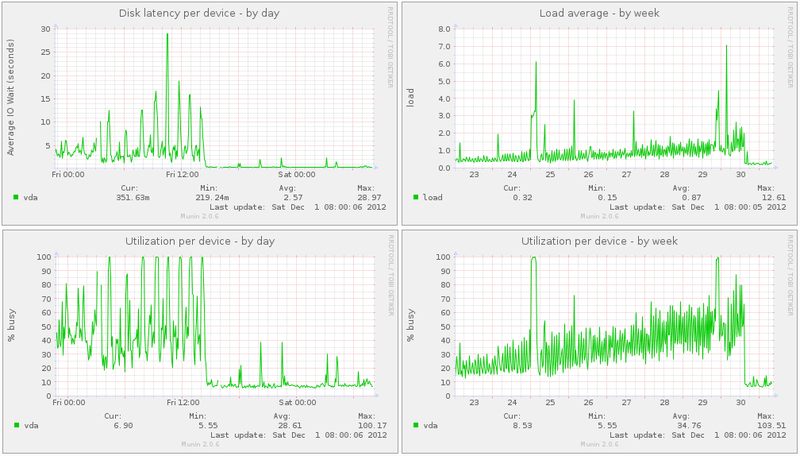 Notice how disk latency and utilization drop as explained above, including system load. Image showing what sort of load the virtual machine was under. I blogged about this just a few days ago at http://pthree.org/2012/12/03/how-a-zil-improves-disk-latencies/. WARNING: Some motherboards will not present disks in a consistent manner to the Linux kernel across reboots. As such, a disk identified as /dev/sda on one boot might be /dev/sdb on the next. For the main pool where your data is stored, this is not a problem as ZFS can reconstruct the VDEVs based on the metadata geometry. For your L2ARC and SLOG devices, however, no such metadata exists. So, rather than adding them to the pool by their /dev/sd? names, you should use the /dev/disk/by-id/* names, as these are symbolic pointers to the ever-changing /dev/sd? files. If you don't heed this warning, your SLOG device may not be added to your hybrid pool at all, and you will need to re-add it later. This could drastically affect the performance of the applications depending on the existence of a fast SLOG. Adding a SLOG to your existing zpool is not difficult. However, it is considered best practice to mirror the SLOG. So, I'll follow best practice in this example. Suppose I have 4 platter disks in my pool, and an OCZ Revodrive SSD that presents two 60 GB drives to the system. I'll partition the drives on the SSD, for 5 GB, then mirror the partitions as my SLOG. This is how you would add the SLOG to the pool. Here, I am using GNU parted to create the partitions first, then adding the SSDs. The devices in /dev/disk/by-id/ are pointing to /dev/sda and /dev/sdb. FYI. Because you will likely be using a consumer-grade SSD for your SLOG in your GNU/Linux server, we need to make some mention of the wear and tear of SSDs for write-intensive scenarios. Of course, this will largely vary based on manufacturer, but we can setup some generalities. First and foremost, ZFS has advanced wear-leveling algorithms that will evenly wear each chip on the SSD. There is no need for TRIM support, which in all reality, is really just a garbage collection support more than anything. The wear-leveling of ZFS in inherent due to the copy-on-write nature of the filesystem. Second, various drives will be implemented with different nanometer processes. The smaller the nanometer process, the shorter the life of your SSD. As an example, the Intel 320 is a 25 nanometer MLC 300 GB SSD, and is rated at roughly 5000 P/E cycles. This means you can write to your entire SSD 5000 times if using wear leveling algorithms. This produces 1500000 GB of total written data, or 1500 TB. My ZIL maintains about 3 MB of data per second. As a result, I can maintain about 95 TB of written data per year. This gives me a life of about 15 years for this Intel SSD. However, the Intel 335 is a 20 nanometer MLC 240 GB SSD, and is rated at roughly 3000 P/E cycles. With wear leveling, this means you can write you entire SSD 3000 times, which produces 720 TB of total written data. This is only 7 years for my 3 MBps ZIL, which is less than 1/2 the life expectancy the Intel 320. Point is, you need to keep an eye on these things when planning out your pool. Now, if you are using a battery-backed DRAM drive, then wear leveling is not a problem, and the DIMMs will likely last the duration of your server. Same might be said for 10k+ SAS or FC drives. A fast SLOG can provide amazing benefits for applications that need lower latencies on synchronous transactions. This works well for database servers or other applications that are more time sensitive. However, there is increased cost for adding a SLOG to your pool. The battery-backed DRAM chips are very, very expensive. Usually on the order of $2,500 per 8 GB of DDR3 DIMMs, where a 40 GB MLC SSD can cost you only $100, and a 600 GB 15k SAS drive is $200. Again though, capacity really isn't an issue, while performance is. I would go for faster IOPS on the SSD, and a smaller capacity. Unless you want to partition it, and share the L2ARC on the same drive, which is a great idea, and something I'll cover in the next post. Posted by Aaron Toponce on Thursday, December 6, 2012, at 6:00 am. Filed under Debian, Linux, Ubuntu, ZFS. Follow any responses to this post with its comments RSS feed. You can post a comment or trackback from your blog. For IM, Email or Microblogs, here is the Shortlink. Aaron, I really appreciate your series. Condenses and drives home the volumes of stuff read on ZFS in plain English with examples. One question... What did you use to track/graph the disk usage over time ? Note regarding my previous post. I am using RHEL 6 but still finding much benefit from your posts. I would like to track and graph the iowaits and such over time like you did. Thanks for the series and the quick response with the tip. I tried the URL "http://zen.ae7.st/munin/" in the article with no response but the URL in the comment worked fine & now I am researching "http://munin-monitoring.org/"
Yeah. I took it down, because it was thrashing my drives due to 250 MB snapshot differentials every 15 minutes. I need a better solution. No. TRIM *is* needed, even under ZFS. It's TRIM that tells the drive what blocks are actually free, as the drive has no knowledge of what is or is not allocated/in use by the filesystem. This is unrelated to ZFS's COW operation. Many SSDs use NAND memory, which must be zeroed before data is stored. Without TRIM, the SSD won't know when the filesystem (ZFS or other) is no longer using a block, so it will have to zero out a block each time it's written to. With TRIM, the drive is aware of what blocks aren't in use, and can zero them out ahead of time instead of at the actual time of write. This is the "garbage collection" SSDs perform, and it is unrelated to any "garbage collection" that might occur at the filesystem level. Wear leveling is also important, but that's also a function of the drive and not the filesystem. Since logical blocks on a drive do not necessarily map to specific physical blocks on modern drives (e.g., spare blocks can be mapped in by the drive in a way transparent to the OS and user), "wear leveling" (i.e., trying to distribute writes physically across a device) in the filesystem is futile at best. Correct me if I'm wrong, but if you "will likely not need a large ZIL" and decide to only use a few GBs for it, wouldn't you need to calculate your life expectancy using only the small portion of disk that will be repeatedly written to SSD? This would produce a much shorter life expectancy. For your example, if 5 GB is used for 5000 write cycles you'd have only 25Tb, or less than a third of a year life expectancy. Use an SSD that has wear leveling algorithms built into the driver, then ZFS can take advantage of them, and you won't chew through the same physical chips on the board. Makes sense-- but then even though "ZFS has advanced wear-leveling algorithms" you won't be using the ZFS feature. In other words, if you want to go cheap and depend on ZFS wear leveling, you'd need to give it the whole device to work with, not just a small portion of it. No, you don't. Again, ZFS will wear the SSD correctly. The partition will move across the chips evenly, and every chip will get the same amount of wear as the rest. 2. ZFS has access to the whole device, so it can do the wear leveling. My point is: Don't try to save money by using SSD devices that don't support wear leveling, if you aren't planning to give ZFS access to the whole device. The performance gains come from the low latency of the SSD. The synchronous write is written to the SSD, which acks back quickly. Then the data is flushed from RAM to spinning platter, as you mention. So, the performance increase comes from the SSD's low latencies. to Alan. TRIM and GC is not the same, and WL is another one. TRIM can force to reorganize some cells to clean whole blocks after OS deletes some data from drive. GC will do the same but not on OS command but in background. dont bother TRIM for new SSD with advanced GC. old SSD has poor GC and TRIM was only one way to prepare new blocks for newwritten data. "It is a disk image on a GlusterFS replicated filesystem on a ZFS dataset." Does this mean that the images (and their virtual hard-drives) are actually and physically "over" a GlusterFS, and then, over it you use ZFS?? If so..., is the ZIL disk directly connected to the virtual machine?? Or through GlusterFS as well? "First and foremost, ZFS has advanced wear-leveling algorithms that will evenly wear each chip on the SSD." http://www.slideshare.net/dpavlin/cuc2013-zfs (page 6, last point) seems to indicate if you need 10GB of SLOG, you should create a partition of 100GB. Would you agree with this? Dzezik - That is not quite how it works. How does the GC algorithm know which blocks are empty? Without TRIM (or knowledge of the filesystem in use) the only way is when a block is overwritten. GC uses TRIM to know which logical blocks were written but are now considered empty (deleted on the FS) before they're overwritten. This also plays into wear leveling because GC moves around much more invalid (written once but not marked by TRIM as deleted by the OS) data for writes that don't fill a physical "block" (a page). These considerations along with the fact that logical blocks aren't statically mapped to physical pages (it's a dynamic mapping maintained by the SSD firmware internally on excess flash that is not user accessible) are why the author's statements on not needing TRIM and ZFS providing wear leveling aren't accurate. ZFS can not provide this function for the drive. Just a "little" tweak to make actually your ZIL to do the work you have to set sync to "enabled" otherwise it is not used and basically is a waist. I couldn't understand why alloc on my log was 0. I'd like to know what happens when - instead of a power outage - the SSD containing the SLOG breaks. It's clear that the cached-to-be-written data is lost. Is there anything different from the power-loss scenario? Anything else than pool is "degraded"? Needed metadata missing? We are looking for some kind performance tunning in ZFS. So will you be able to help us to do so. If yes please mail me at nawang81@gmail.com or share me your email address. To confirm an assumption, if this statement is true "ZFS will wear the SSD correctly. The partition will move across the chips evenly, and every chip will get the same amount of wear as the rest. ", that means a larger disk, with more chips, takes more time to wear out or the smallest disk, is not always the best option considering longevity. Just a quick question - regarding your estimations of life-expectancy of the SSD, that's only for the ~several GB partition you're using, correct? So one 60 GB SSD with a 5 GB partition could last ~12 times that estimation for just a 5 GB partition. So every few years, create a new partition, remove that which is currently added to the pool, and add the new to start writing to a new portion of the space? Or do the algorithms/code not work this way?